This entry isn’t an ad per se but I’m going to be at Northcourt Manor, at Shorwell on the Isle of Wight doing a Living History gig set in 1642 as the English Civil War is about to kick off. The group I ‘re-enact’ with get together once a year to run an awesome Living History (as opposed to a battle recreation) on the Isle of Wight and we are called ‘Church State and Household‘. I reckon we put on a great event, suitable for any age, where you can learn about everything from life in the military to how food was prepared. We also try to explain to people the different perceptions of the politics of the time. There is a lot of social history communicated as well. 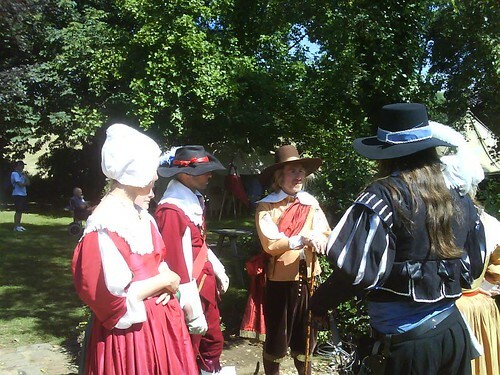 The day is a lot like taking part in a murder mystery event: guests are immersed into a day in the life of a 17th Century working manor (in this case, the estate of the Governer of the Isle of Wight). However, the King and his Parliament have not been getting on, and the whole country is poised on the brink of war… Given the Governor is a staunch Parliamentarian, visitors are likely to become embroiled in plots and schemes and witness history unfolding. As well as the threat of Civil War looming, there other things afoot: smugglers, disputed wills… Every day there is a mystery for you to solve! We take historical personae and events from what we already know about Northcourt- it was indeed owned by the Leigh’s, the governing family at this time, and build a more detailed story around what the history books record that you can come and take part it. We never say that the story we tell is exactly what did happen, but promise you that it could have! The event starts on the 8th August and gates are open to the public from 1o.30am to 5pm each day. It’s £7 for adults and £4 for kids, under fives are free!